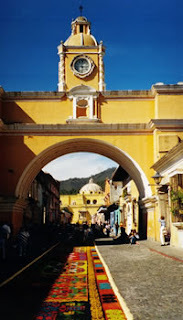 Here in Guatemala and the rest of Central America, this is a week of excitement and joy in honor of the Holy Week. This week, towns all throughout the country host enormous celebrations, featuring colorful parades, extravagant floats, and intricate costumes. Tourists from all around the world come to take part in the festivities. Of the festivities, Antigua boasts the most extravagant festival in Guatemala. 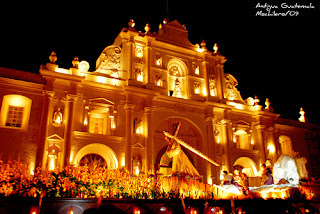 Beginning Ash Wednesday and ending on Good Friday, tourists and locals alike fill the streets to participate in Catholic processions commemorating the life and death of Christ. 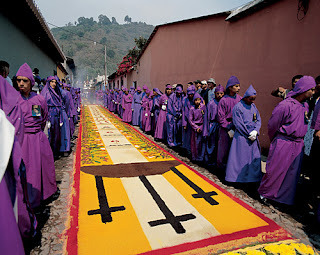 Unique to Antigua is the tradition of “Alfombras de Acerrín,” the Carpets of Acerrín. 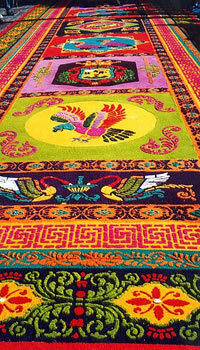 Before the procession, every street through which a procession passes is lined with an intricately woven, colorful carpet. Though preparations for the carpets begin months in advance, the carpets are not woven until the day before the processions so that they will be laid immediately before the floats arrive. The unique festivities that mark the arrival of Semana Santa in Guatemala are the largest of any religious holiday throughout the year, and certainly a site to see. Need we mention that work and school is cancelled throughout the country this week, so we are all off enjoying the celebration?